I hate summer! My phone always claims I must have been switched at birth because everyone in my family loves the warmer months. Everyone but me. I like the ridged cold air! I sleep with my window open through at the entire Winter. I love the fact there is no bugs and I even get to wear all my cute sweaters. Summer on the other hand I am covered in sweat, bug bites and I always feel like I am on the verge of a heat stroke. I just HATE it. The one thing I do look forward to is my grill! Is it just me or does everything taste better when made on the grill? Chicken, steak, burgers, corn, hot dogs, shrimp, peppers and there is so much more! The grill just takes these things from good to amazing! Next you need to season your burger just right. My hubby loves doing this part, he throws in all sorts of sauces and seasonings to make them just right. Finally you need the perfect even cook. In order to get that you burgers need to be pressed just right. Yes I know you can roll them out in your hand, but to get that perfect burger they should be even on all sides. Perfect sized- If you like large, thick burgers this is the press for you!! This press makes 6 1/3 pound square burgers. To give you an idea of how big that is I placed my finger inside the press to show you how deep it is. 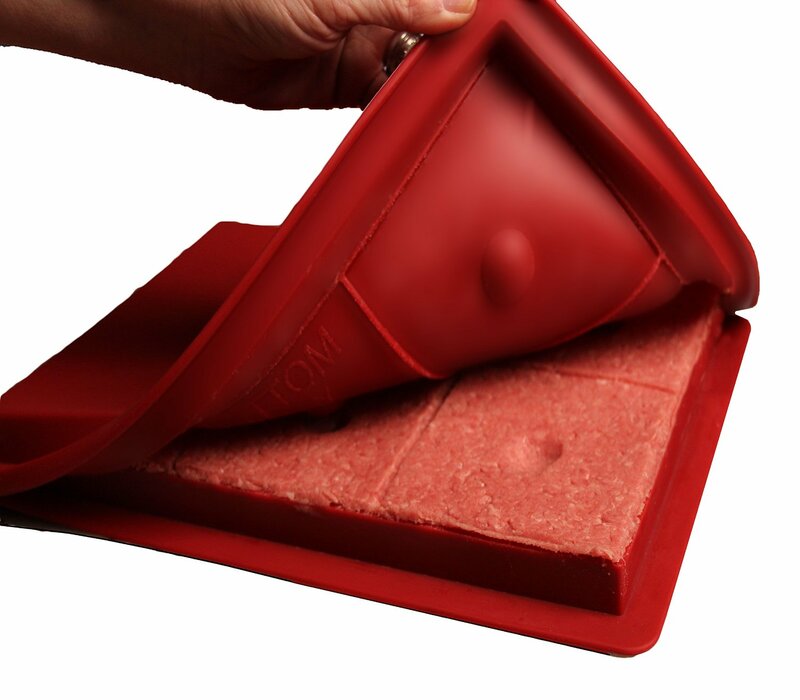 Easy to store and clean up - You can put the press in the freezer to keep any burgers you dont make. All you can place it in the dishwasher for an easy hands free clean up. I don't have a dishwasher though and thanks to the silicon material the burger press is easy to clean even by hand.